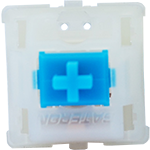 Similar in feel to Cherry MX Blues, Gateron is Cherry Clone with a feel that more than holds its own with Cherry. I think these may be better than Cherry MX Blues..
After a little bit of a time this bugs you but still a good switch if you are used to clickyness. Have experience using Gateron Blue switches? Add a review to share your knowledge with the keyboard community.